• Your family reunion venue – The Columbus area has plenty of wonderful places to throw family reunions and spend quality time together. At the park, at a farm, or right at home in your backyard, your party venue Columbus will be enhanced by our delightful Bucceto’s fares. For catering, we have our Smiling Teeth pizzas, gluten free options, vegetarian dishes, appetizers, salads, and so much more. • At your wedding venue – Choosing and reserving your catering for your wedding is just one of many tough decisions you’ll have to make while planning your wedding. For your chosen party venue Columbus, Bucceto’s provides a myriad of great picks that will feed your guests and leave them satisfied. Our catering menu provides salads, soups, entrees, pizzas, pastas, and desserts, so you can provide your guests with a full multi-course meal experience they’re sure to love. 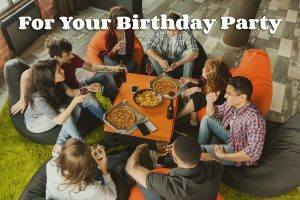 • For your birthday party – Birthday parties are supposed to be memorable, and like many celebrations, they’ll center heavily around the food being served. At your party venue Columbus for your birthday, our Bucceto’s catering menu is just what you’re looking for to ensure you keep the celebratory atmosphere going with something everyone is sure to love. While our pizza is a classic, we also have calzones, sandwiches, and plenty of finger-food friendly satisfying apps. To finish the night off, you can also try our Tiramisu or authentic NYC Carnegie Deli cheesecake in lieu of a traditional birthday cake! Your party venue Columbus, along with our Bucceto’s catering, is sure to make your celebration memorable.